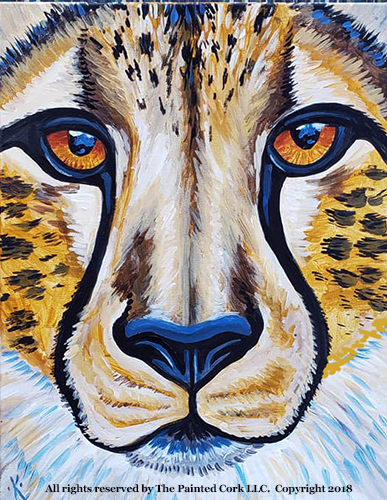 Santa.Cruz.Studio 12/2: The Art of Saving a Cheetah Public Fundraising Event ~ OPEN TO THE PUBLIC! On December 2, 2018 we will be celebrating the cheetah for International Cheetah Day, which actually is on December 4th. This special day was developed to generate awareness for the cheetah in memory of the birthday of Khayam, a cheetah Dr. Laurie Marker raised from a cub at Wildlife Safari, in Oregon. Khayam was trained for the first research project in re-wilding and inspired Dr. Marker’s first trip to Namibia in 1977 and to found the Cheetah Conservation Fund (CCF) in Namibia in the 1990s. More information on International Cheetah Day can be viewed here: https://internationalcheetahday.com. Proceeds from this event will go to supporting the Cheetah Conservation Fund (CCF), a non-profit organization dedicated to a wholistic approach to saving the cheetah since the 1990s. CCF’s conservation programming is rooted in scientific research. CCF maintains a research program on the biology, ecology and genetics of cheetahs that publishes papers in peer-reviewed journals annually, and currently operates the only fully-equipped genetics lab at an in-situ conservation facility in Africa. There is an urgency to protect the cheetahs because it is estimated that there are less than 7500 wild cheetahs left in the world. They need our help from being poached for illegal pet trade, being killed by local farmers and hunted for their fur. Join us in painting a portrait of a cheetah and enjoy some wine, food, cheetah merchandise and good people. Come enjoy this fantastic "paint and sip" fundraising event! We provide the wine, food, painting supplies and instruction on how to paint the beautiful Cheetah Face painting (no painting experience necessary!). There will be a small presentation about cheetahs and CCF while you enjoy the goodies from local food places and wineries. With registration of painting you will be entered into a drawing to win a raffle that contains local goodies and services. We will do the drawing after our short presentation. **An Anatolian Shepard will be visiting the event. You can meet the dog breed helping to Save the Cheetahs in Namibia!